Are you tired of finding restriction sites? AS ONE INTERNATIONAL provides high quality and easy-to-use kits and reagents for cloning, sub-cloning, generating transgenic animals, and manipulating DNA constructs. Particularly, Red/ET Recombineering offers unprecedented freedom in gene cloning. It gives you the powerful tools to clone, subclone, and modify DNA at any chosen position. 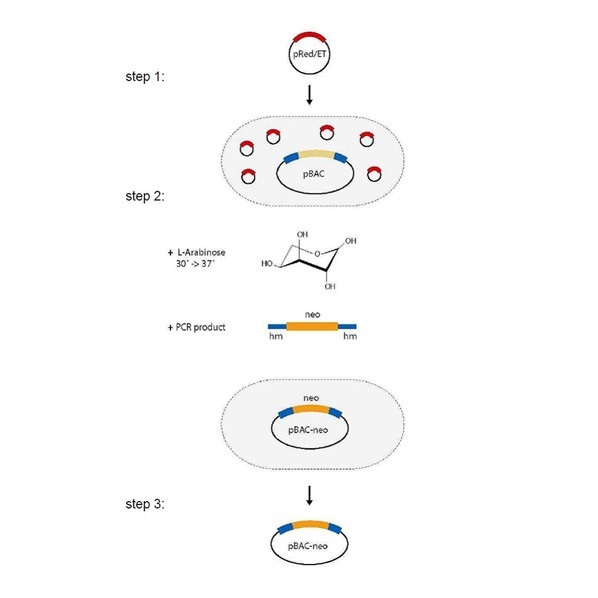 These Red/ET Kits, Selection Cassettes, and Recombinase Plasmids permit precise engineering of DNA molecules of any size, including very large ones such as BACs or the E. coli chromosomes. 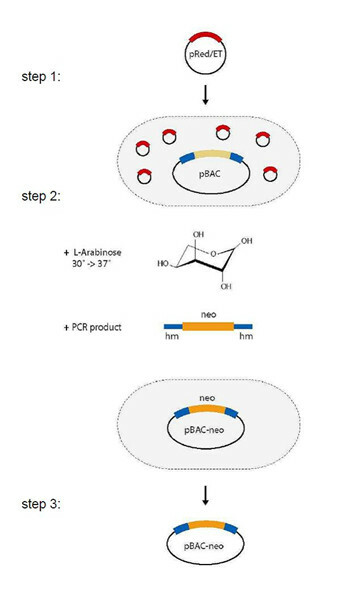 Step 1: The E. coli strain carrying the BAC, which is to be modified, is transformed with the expression plasmid pRedET. Step 2: The expression of genes mediating Red/ET is induced by the addition of Larabinose and a temperature shift from 30C to 37C. After induction the cells are prepared for electroporation and the linear Tn5-neo cassette (PCR product) flanked by homology arms is electroporated. Red/ET recombination inserts the functional cassette into the target locus. Only colonies carrying the modified BAC will survive Kanamycin selection on the agar plates. Step 3: The successful integration of the selection cassette will be monitored by PCR or DNA mini preparation.